Are you headed to a weekend crop or scrapbook retreat soon? 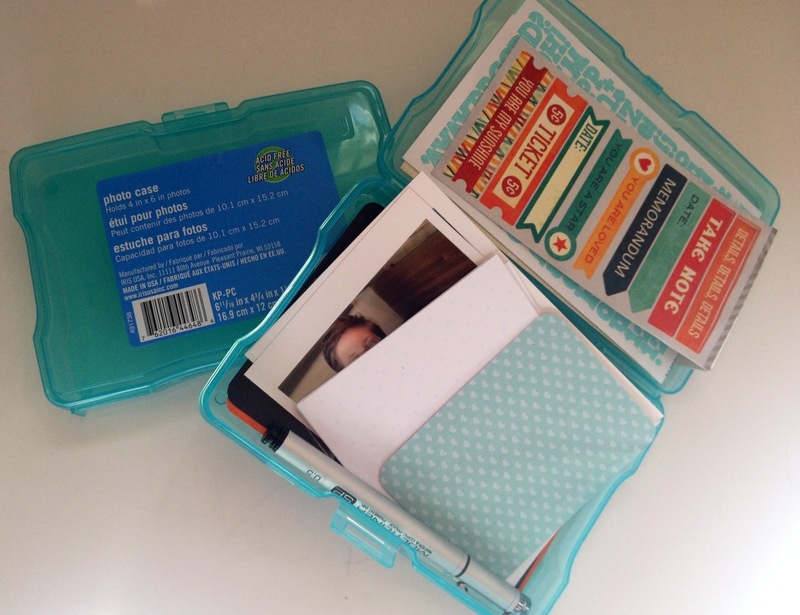 Are you a Project life scrapbooker on the go? Are you looking for a simple way to organize your cards + photos + embellishments by week? I have a great solution for you! A couple of weeks ago I purchased this large iris photo storage case from amazon here. I have also seen it at other popular craft stores where you can use a discount coupon. My purpose in buying this case was to organize my scraps by color cut down to 3×4 and 4×6 to make them more useable for my project life album. I also purchased individual 4×6 plastic cases in a teal color for odd’s and ends scraps that were not sized for PL but that I still wanted to keep. Here is a photo of the Iris photo case that holds 16 of the smaller photo cases inside. Now this worked perfectly for scraps (Special thank you to Lisa McIntyre from the Scrapbook/craft organization ideas facebook page) See Lisa’s Photo below. Now I got this scrap organization going and I was a very happy scrappy girl indeed. I had some leftover teal smaller photo cases that I figured I would use somehow for something later on. Then I got to thinking, If I were to pack up for a scrapbook crop somewhere how would I do that, especially beings I primarily scrapbook PL style right now? A little lightbulb went off in my head and I quickly went to test my idea out. Want to know the best part, IT WORKS! It works so well I am thinking of adapting this into a system for me to keep me on track with my project life beings I run about 3-4 weeks behind. It will also help me spread out my supplies, and hopefully not over buy certain supplies. You can even take your monthly project life kit and split that up by week! 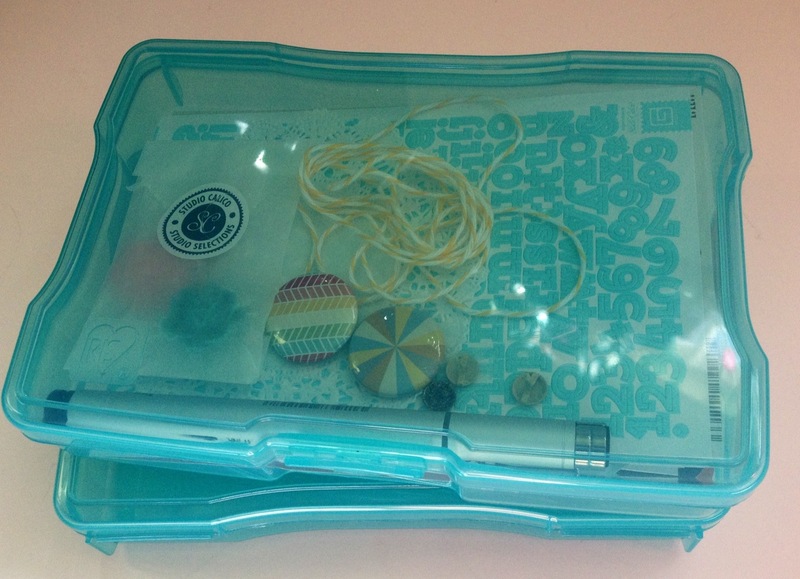 Keep a little box in your purse with journal cards and your favorite journal pens, close the case and you have a hard surface to write on while you’re at your childs soccer practice or ballet lessons… Possibilities are endless my friends! But, what about the larger pieces of memorabilia? you could always tape a large plastic paper organizer to the front of your case and slip in those larger bits and pieces. Whatever works for you. Normally I don’t have anything bigger than what would fit in the small photo case. 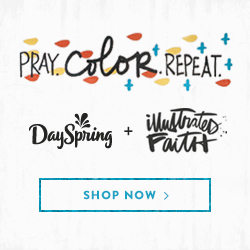 Just pop in printed photos, the cards in the color combo you think you might want to use, your embellishments, your journaling pen or special color marker even…. these little boxes can surprisingly hold quite a bit! *Bonus idea* Want to give a gift to your project life scrappy friend? Pack up some Journal and filler cards, embellishments, a fun pen in one of these little photo cases (costs less than a decorative gift bag). Pop a little card/tag on top and tie with some twine or ribbon and you will have a friend who adores you even more! Totally amazing idea right? I am planning on doing some scrapbooking on the go this summer…. 5 or 6 of these little guys packed up in a scrapbook tote with some basic tools/supplies and my album and I am totally set! How about seeing how this works first hand? I have a little project life goodie kit giveaway just for you packed full in one of these little photo cases (cards, embellishments, stamps, pens, etc..). What do you need to do to enter to win? Simple, Just follow my blog via email (there is a spot to enter your email address in the upper right hand corner to make it easy) and leave a comment with your name, location, favorite color(s) and something about project life…. could be a tip, something you love about PL, something you want to see featured on my blog, or something telling me about the things you scrapbook about (will help me customise your prize a little bit better)…. anything at all… I love reading comments from you all! Good Luck! I love pink & green. I love PL for how simple it is. 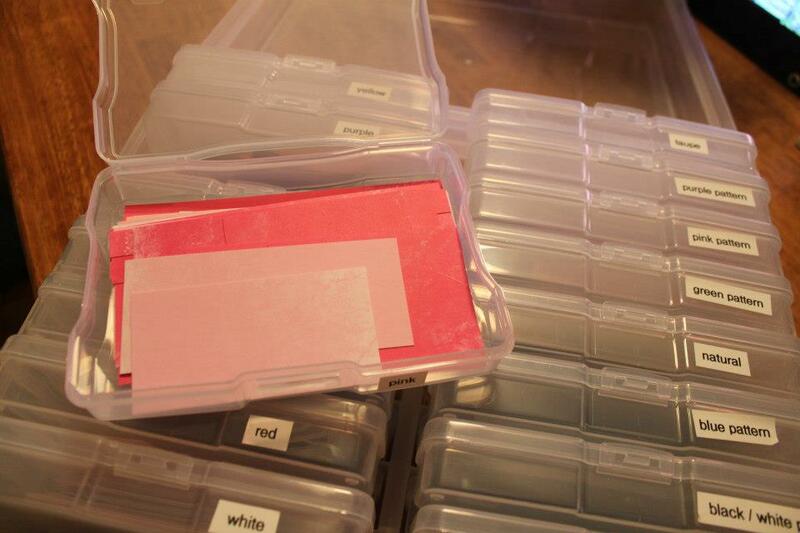 I have been using those boxes for some of my embellishments, but LOVE your idea on using them for scraps. I used something similar for a trip away in January. Loved how compact you can keep everything when packing for a trip. Love reading your posts and would love to see more about organization tips as you are my organizing guru! I have been wanting to cut all of my 12×12 paper but didn’t have a clue as to how to organize/store them – thanks for the great tip! That’s such a great idea for storing PL stuff on the go. I think I will make a purse one with some blank journaling cards for the summer! Thanks for the chance to win, btw! This is my first year with PL and I am loving it!! I love that my daughter who is in college is willing to send me pictures of her life so I can include her in my PL. this is a great organization idea!! I like a lot of colors….rainbow, blues, lime green, orange..not very picky with color! I followed your blog, but I had it in my favorites already!! I love this idea!! I love it!! I am going to a crop next week, and it would be perfect for finishing my 2012. Yup — I’m THAT far behind! Love your idea. 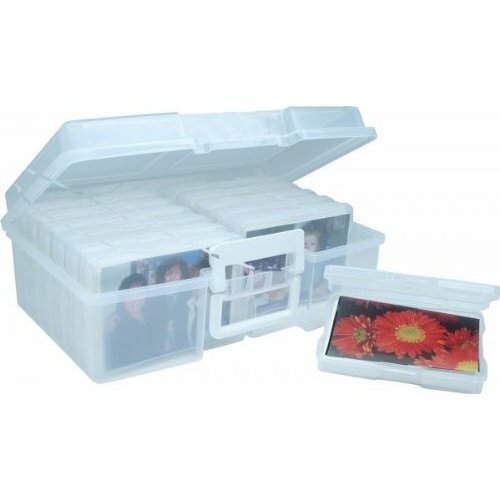 I scrap on the go a lot and I even have a couple of these boxes that I’ve used to store photos. This is my first year to do PL. I’m a grandma to 3 and since the kids are here a lot I have plenty of photos and activites to fill a PL album. I love aqua, yellow, red and green so my album is bright and cheerful. Just started with PL and will not be doing the weekly pages but starting out with our recent trip to Italy because I can see it will not be scrapbooked in the traditional manner anytime soon and am already loving the first pages I am working on. Love this storage idea. I also use these containers to store embellishments. This is an awesome idea. Love bright fun colors! I love PL for all those little things you want to save but not make a whole scrapbook page about. And I love that it just shows our ordinary everyday life. I’ve seen these containers but never really looked at them. Love how they are a clam shell. I’ve been using my CM power sort box inserts but it doesn’t work well for embellies. This is perfect. I usually take PL when I go to crops so I need something portable. My favorite color right now is turquoise/aqua, especially when it is with other bright colors. Perfect idea! Love this idea, especially since I am about 3-4 weeks back also in my PL. I love keeping everything together like that, especially to take it on the go. I am loving PL to keep up with all the details of my two teens lives. I’m in Cedar Rapids, IA and love bright colors. Really liking aqua, yellow and greys right now as a color combo. Thanks for the ideas and the giveaway. I have been using a few of the smaller cases for my PL but love the idea of the bigger case and being able to store all of my cards in it. Great tips! My favorite color is blue and I have been doing PL is some form or another for the past 4 years. Thanks for the chance! Dawn F.
You are just full of great ideas! I love this method for storing the bits and pieces for PL! I have been using baskets and the boxes from my monthly kit. I like this idea better! I have a post on my blog about using the left over plastic after cutting down a page protectors…check it out! I love this! I have been spending a lot of weekends up with my daughter and new grandbaby, and this would be a perfect way to take my PL stuff! Please don’t enter me, but thanks so much for all your organization ideas! I loved these ideas. I’m always tweaking my organizational system, so you have given me some new ones. Right now I am using PL mostly for travel scrap booking. My favorite colors are yellow and aqua. Love this! I actually have a smaller size of this without the front handle and you’re so right, the little boxes would be perfect for Project Life storage. I am new to Project Life and won’t be doing it on a daily or weekly basis, instead I plan on combining traditional layouts with PL because I snap SO many pictures of each event. I never seemed to be able to eliminate any especially the tons from this first year of my son being in college. . My favorite color is Blue and I’m really loving those colored boxes, I thought they only came in the boring clear so now, I have to hunt for those. I love the inspiration of your post for organizing my Project Life goodies. I seem to be in the process of collecting and not being able to get everything together to actually create a full project. Now mind you, I’ve almost filled up a whole box of divided photo sleeves with the photos placed but I haven’t done anything with placing cards, or titles, or journaling or incorporating embellishments yet. Looking forward to reading more by you, now that I’m signed up for your blog updates. What a great idea! I’m always looking for new ways to organize and simplify my craft stuff. I love PL because it makes me think, on a daily basis, about all the little things we do or cute things the kids say, and it makes me take more pics to remember them. I have never been a traditional scrapbooker but since I found PL I take far more pics than I used to. And, I have a journal app on my phone that I use to write a little note each day about what we did. Even if I get months behind it is not very hard to catch up with this tool. I live near Seattle. My fav colors right now are blues and yellows, although I have two little girls so I do use a lot of pink! Thanks so much for a chance to win. This is a fantastic idea! I am a very busy Mom of 3 (4 months, 4 years & 6 years) and I think this idea will help keep me up to date with all 4 of my books ( 1 for each child and a family book) because I can maximize wasted time waiting for Dr. Appts etc. I think these little ” travel kits ” are a fantastic idea. I plan on preparing several of these with the necessary embellishments and photos so that when I am headed to the hospital to sit and wait (during my sons tonsillectomy) I can do all my journaling and embellishing to help pass the time….then I can just slip everything in the pockets when I get home. Also, these are excellent for during the 4 hour car ride to visit my parents several times this summer…hubby drives and I can embellish to my hearts content! Thanks for the idea and the chance to win! I am bright color kinda girl, who is crazy about buying cut-apart sheets right now! I am working at a boy scut camp again for the summer and I wanted to bring supplies along with me, but I am worried about critters. This seems like a great way to keep everything sealed and safe. Thanks for the idea and a chance to win. Such a brilliant idea! 🙂 I don’t scrapbook much on the go, but I really love having a kit all picked out and ready when I have time to sit and play. I pretty much don’t do any ‘traditional’ scrapbooking anymore, but PL totally fills that creative aspect for me. I love that I don’t feel the pressure to have perfect photos or super-fancy events or large, detailed stories to be able to make something creative with my photos! For PL I have found that sorting through my ginormous stash and cutting down a sheet of each paper in a collection pack to 4×6 and 3×4 sizes to be stored in my blue Raskog cart works well for me. Not only am I sorting through pretty paper but I will use it more if its already cut and ready to go. This is awsome! Newer to PL (started at the beginning of the year) and still experiencing some growing pains as I try to sort out what works for me. This looks like such a great idea to help keep “caught up”! Love PL because it lets me document all those day-to-day details that I want to remember but don’t want to devote an entire 12×12 layout to. Love scrapping about my new puppy and life with my hubs! such a great idea! I’ve been thinking about creating an on the go PL bag for those moments where the boys fall asleep in the car , etc. I am loving aqua/teal/navy right now! the thing I love about PL is that it is more manageable for this mom to two boys- two and under. I can treat each little pocket as it’s own entity/layout and do as little or as much as I want! there is no pressure to make a whole page look perfect. This is an AMAZING idea, I have spent the past half an hour trying to find a way to buy them in Australia. This would be a great way to put all my goodies together for the weeks I am behind. A sensational way to organise my PL stuff as I go to a lot of retreats and crop nights. This is DEFINITELY A MUST for Project Lifers!!! I love your blog!! Oops and my favourite colour is PINK!! This is a great idea!! I love project life because it is helping me document our everyday life while my husband is deployed. I am so excited to show him all these little moments and memories from the year he was gone. I hope it helps him feel like he didn’t miss quite so much! What a cute little idea for project life storage!! This would have been amazing for me to take when I went to Thailand a few months ago! I also love how PL helps me document little details of life here… It’s especially great at the moment, since me and my partner are in the process of designing and getting ready to build our future home, so we’ll have less than a year in this place! I use it to record things we do, places we go, food we out, crafty projects I’m working on, what I’m reading, favourites, house choices… The list is endless! I never seem to have a problem coming up with ideas even though it is just the 2 of us. Um, Best PL organization idea I’ve seen yet! I can hardly wait for it be tomorrow, so I can go to a craft store and scoop up a couple of these. I particularly love the idea of putting together little kits in these as gifts. And I’d love to win one for myself! Purple is my general favorite color, but yellow is my favorite PL color. I tend to keep my PL pretty simple. I use digital stamps on my pictures, but I handwrite most of the journaling. My favorite touches are little embellishments – a wood veneer or a chipboard sticker or a bit of washi. Thanks for the giveaway and most of all for sharing this lovely idea. I’m off to pin this! What a great organizational idea. I will be pinning this! My favorite color is turquoise and my favorite thing about Project Life is that I can do it quickly and with minimal stress. This is a GREAT idea!!! My favorite color is green and what I love most about Project Life I can do whatever I want with it. I can get scrappy or be super simple and it still looks great! Awesome giveaway! I love this storage system and I really like the gift idea. So perfect for fellow scrappers. I seem to use a lot of blues in my PL spreads; maybe because the colors of the ocean are my favorite…or because I have boys. I am from southwest Ohio. What a great idea! I definitely need to organize my PL supplies better and I love your system. My favorite colors are pastels – pink, lavender, etc. I use a lot of those in PL because I have 3 girls 🙂 I do a PL album for each of my kids, so right now I am working on a lot of themed pages – school, holidays, etc. Doh! I just saw this on Pinterest and clicked over thinking it was a current post. Didn’t realize that it was a year old and your giveaway had ended a long time ago:) At any rate, I enjoyed your organization tips.